AFAM Workslite sprockets are made from aircraft grade 7075-T6 alloy and then hard anodized for added strength and durability. The Workslite design offers superior strength over other brands and the exclusive AFAM tooth profile provides better chain contact for improved performance. 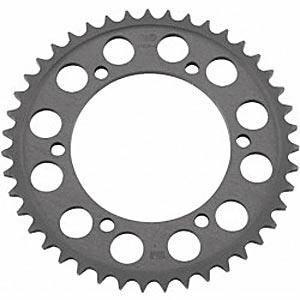 These sprockets are used by most World Superbike and MotoGP race teams worldwide. Note: Images are for reference. Actual product may vary to fit your exact model.